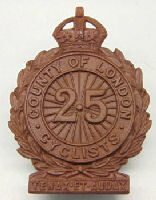 25th County of London (Cyclists) Bn badges. When war broke out the only insignia worn on uniforms was shoulder titles and cap badges. Divisional symbols / insignia existed after the first few months and were painted on vehicles / buildings etc. As the war progressed to thwart enemy intelligence and to make units more identifiable battalion badges / patches were introduced and took the form of symbols / geometric designs images etc. 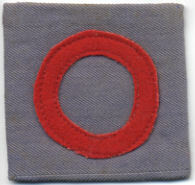 By the end of the war units could be seen with patches unique to their battalion, brigade patches and Div patches. Worn on uniforms (upper sleeves, back of tunics below collar and on helmets). Not every unit had them and not all have been recorded. Cap badges and shoulder titles were never discarded though. For raids these metal titles badges were removed and the cloth patches would ID a soldier to a friend but not the enemy. Imperial Service Badge The Imperial Service badge was awarded to those members of the Territorial Force who were prepared to serve outside the United Kingdom. The conditions of enlistment for the TF laid down at their creation in 1908 did not allow for soldiers to be sent for service overseas against their will, as the TF was intended for home defence. However, any man could volunteer for the Imperial Service Section and serve abroad in times of war, which entitled him to wear this badge. The badge was worn on the uniform immediately above the right breast pocket, i.e. the opposite side to any medal ribbons. See photo of Stanley Ridout. 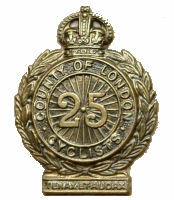 One of the 25th Londons known to have been issued with this medal was Charles Albert Watts. 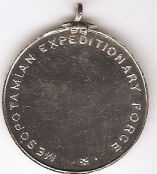 The Territorial Force War Medal was a campaign medal awarded to members of the British Territorial Force and Territorial Force Nursing Service who served overseas in World War I. It is the rarest of the five British Great War medals. :- have completed four years service with the Force before 4 August 1914 and rejoined on or before 30 September 1914.
:- did not qualify for the 1914 Star or 1914-15 Star. A total of 33,944 Territorial Force War Medals were awarded.This includes 227 to nurses of the Territorial Force Nursing Service, the only women to receive the medal. The numbers given to each regiment varied widely. 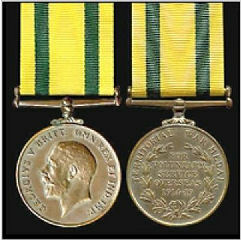 The Territorial Efficiency Medal (TEM) was a United Kingdom award for long service in the Territorial Army. 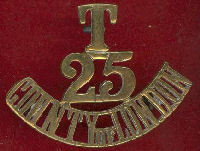 It superseded the Territorial Force Efficiency Medal when the Territorial Force became the Territorial Army in 1921. It was superseded by the Efficiency Medal in 1930. 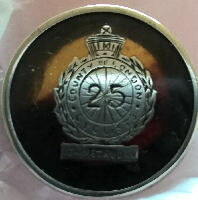 The medal was awarded to non-commissioned officers and men for a minimum of 12 years service in the Territorial Army, providing they attended 12 annual training camps. Previous service in other part-time forces including the Territorial Force could count, while war service counted double. 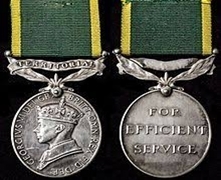 Bars for further periods of 12 years service were intended but never issued, since the medal was superseded by the Efficiency Medal after 9 years. The equivalent award for commissioned officers was the Territorial Decoration. 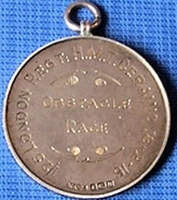 A recipient could wear both awards together, provided they completed the full periods of qualifying service for each. The Military Medal - was awarded for individual or associated acts of bravery. 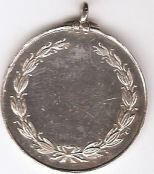 At least one member of the Regiment was awarded this medal - Signaller S. P. Chapman of 'B' company, for bringing in a wounded comrade from a piquet under fire, during the Waziristan campaign in 1917. The reverse side features the fortress of Jamrud, 'The Gateway to the Kyber Pass'. 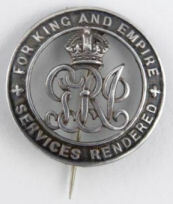 British First World War period 'Silver War Badge'. 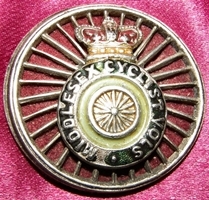 The badge was issued to British service personnel who retired or were discharged owing to wounds, ill health or having reached the age of 51. It was first issued in 1916 and continued until 1920. (Shire Books is a Recommended bookseller - Excellent booklets, low postage).